Stop-motion has always tended towards the creepy and kooky, from the skull-faced Jack Skellington of The Nightmare Before Christmas (1993) to the button-eyed “Other Mother” in Coraline (2009). The unworldly jerkiness of stop-motion is often given as a reason, though Hollywood animators strive to make their work look as smooth as possible. Moreover, stop-motion puppets are real objects, cartoon characters actually present on camera. In 2005, I visited the London “set” of the stop-motion film, The Corpse Bride. The sight of the underworld ghosts and goblins on darkened dioramas, frozen midway through their takes, was disconcerting as a computer or hand-drawn film could never be. 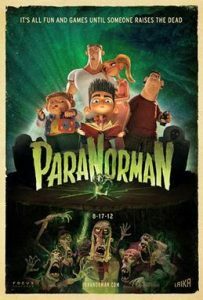 Following Coraline (2009), ParaNorman is another scary stop-motion film from the Oregon studio Laika, by Britain’s Sam Fell and Chris Butler (Butler wrote the story). Ostensibly it’s a zombie film, though after spending its first half setting us up for a Living Dead rampage, it enjoys reversing those expectations. For example, the principals end up besieged in a building, not by zombies but by a live mob (though anyone who remembers the end of Night of the Living Dead, 1968, will know this is still honouring zombie film tenets). ParaNorman’s visual sensibility smacks of The Simpsons, steering away from cuteness and making the modern world seem as grotesque as the horror. (The hero’s teen sister’s wet pink lips are far grosser than the zombies). For all the money on screen – “huge” miniature sets, teeming crowds, and hundreds of individually-created faces per character – ParaNorman sometimes echoes Robot Chicken, a low-rent, abrasively vulgar, stop-motion TV show. ParaNorman’s underlying story, though, is winsomely sweet-natured to the point of glibness, being one more movie cheering the boy outsider. Social outcast Norman is excluded because he sees (friendly) ghosts all round town, greeting them shyly and respectfully. His living peers, of course, are too busy texting or sneering at the rejects, with the exception of a podgy loser boy (a naked stereotype, but with a genuine niceness). Unfortunately, the “support the outsider” ethos gets rather over-egged. At first, it seems that Norman must save his town from a witch’s curse and marauding zombies, an exciting prospect. Eventually, though, it turns out that he must address a grim crime wreaked by society upon another innocent outcast. As in this year’s cartoon The Lorax, the sombre turn feels heavy-handed, drying up the scares and comedy. Until then, though, the film hits a confident, crowdpleasing tone. The horror gags include a hilarious opening scene from a (very bad) zombie video nasty that Norman watches with his late granny; Halloween and Friday the 13th both randomly referenced inside of a minute; and a ghost-in-a-toilet-cubicle set-piece presented with a seat-rattling relish. There are fewer gothic scares than in other stop-motion films, though there are shadowy woods and a nightmare sequence with child-catching trees. The zombies, as one might guess, turn out to be groaning nitwits and fall guys; the “real” monster is a cloud-creature in the heavens, a pleasingly homely vortex that suggests taffy or cotton wool. In the end, though, it’s not as vivid a creation as Coraline’s Other Mother, Nightmare Before Christmas’s boogeying sack-thing or the fluffy-tailed star of 2005’s Wallace and Gromit: The Curse of the Were-rabbit.